“The language game raises very difficult if not impossible problems.” Discuss this statement by examining both verification and falsification. The language game is moving away from the idea that language is just there to describe or ‘picture’ things. Ludwig Wittgenstein came up with the notion that words and language are part of an ‘anti-realist’ or postmodern approach to language. He believed that language statements (including religious ones), are not intended to be true or false for everyone, but only for those who are within that form of life i.e. a scientific statement would be true or false for a scientist but not for an artist. The term 'language game' is used to refer to fictional examples of language use that are simpler than our own everyday language, simple uses of language with which children are first taught language (training in language), specific regions of our language with their own grammars and relations to other language-games and finally all of a natural language composed of a family of language-games. The concept was intended "to bring into prominence the fact that the speaking of language is part of an activity, or a form of life". All forms of life have their own language and have their own rules concerning meaning. The language in the game is non-cognitive, because it is not about making universally true statements, but about communicating meaning to other players in the same game. Due to each distinct life form having their own unique language, it means that it’s almost impossible for others to criticize who in turn have their own language game unless they learn the rules and conventions of the language of that form of life. The principle applied is that of rules, as would be applied to any other game. It would be foolish to attempt to play rugby according to the rules of netball. 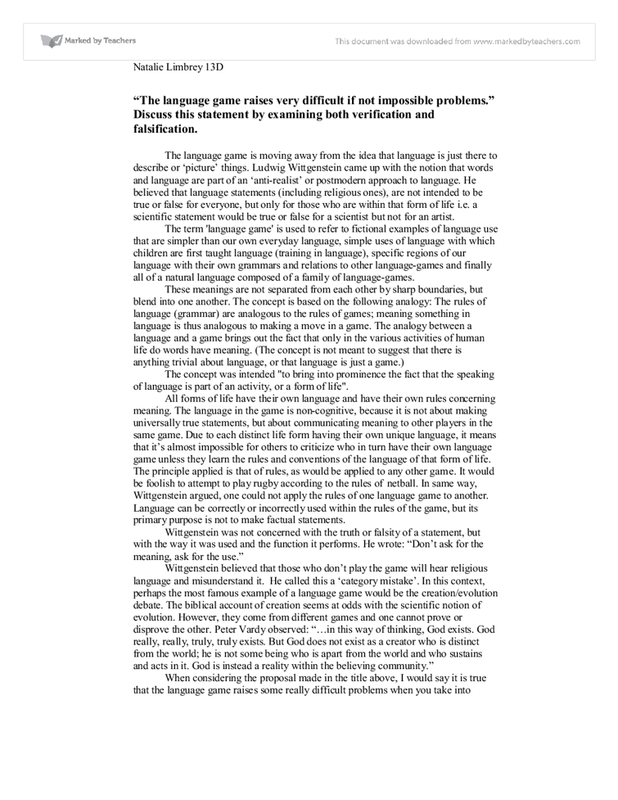 In same way, Wittgenstein argued, one could not apply the rules of one language game to another. Language can be correctly or incorrectly used within the rules of the game, but its primary purpose is not to make factual statements. When considering the proposal made in the title above, I would say it is true that the language game raises some really difficult problems when you take into account that language games do not allow believers’ claims to be empirically tested. Also religious language alienates those outside the game, meaning that those who don’t understand or have not yet learnt the rules, will misunderstand what is trying to be said. Furthermore the rules of the games cannot be changed to allow outsiders in which could be seen as unfair. It is also possible that the language game theory is nothing more than a compromise. The aim of the principle is to avoid the problems in making religious claims which intend to make factual claims, but even though religious language clearly does use non-cognitive forms, many believers would not be prepared to say that all religious language is non-cognitive. It doesn’t require a believer to argue that their assertion ‘God exists’, or ‘God loves me’, is meant to be more that a symbolic statement or an ethical claim about their lifestyle. God may be transcendent, but for the believer he is also experienced in the real world, and there is cognitive meaning in their claims about him. However in some respects the statement doesn’t reflect the truth when you think about the fact that it highlights the non-cognitive nature of religious language. It distinguishes it from other types of language, making it become more unique. Also language games provide boundaries for the correct use of language and believers can be initiated into the rules of language. 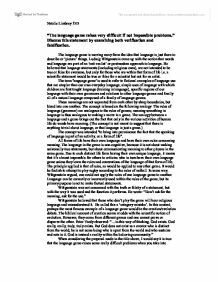 Finally language games defend language against criticisms from other ‘forms of life’, since truth is understood as relative and statements are to be judged against their context and no on whether they are inherently or objectively true or false. So the language game theory may not be entirely acceptable to believers, and neither does it necessarily satisfy the disbeliever. The claim that no language game can be criticised by someone from outside the same language game, assumes that all statements are equally valid. Wittgenstein rejected the idea that what a word means depends on the way the world is. He claimed instead that meaning depends on what we are prepared to count as meaningful and he appealed to an analogy with games and their rules to make a point. Followers of Wittgenstein make the stronger claim that because rules if meaning depend on us and not on the world, it is impossible for rules to be true or false. I agree that it is not right to think of rules being true or false, but I believe that the same sentence can be used in two ways: as a rule and as a statement about reality. When it is being used as a statement about reality, it does not make sense to think of it as being either true or false. This student written piece of work is one of many that can be found in our AS and A Level Philosophy section. &amp;quot;Religious Language is meaningless.&amp;quot; Discuss. Ethical language is meaningless. Discuss. The statement is contradictory and if you put it into it's own context, it is meaningless in itself. If ostensive definition is logically private, how can others understand what I mean when I point to an object? Wittgenstein suggests it is because of shared activities in a public social world/third person perspective. He points out that ostensive definition takes place in a public setting. The best supporter of religious language being symbolic is protestant theologian called Tillich his argument was basic and that all religious language was symbolic and can not be taken as literal assertions about the world. Religious words, actions, objects and events can be interpreted symbolically. Braithwaite believed that they were inspirational as they make us motivated. * It could be a literary device. Ineffable, i.e. beyond language, unexplainable. * A method of interpreting "ultimate reality". They open up like symbols, they have new levels of reality or as Randal argues their purpose is to bind communities together.